The Mona Lisa (/ˌmoʊnə ˈliːsə/; Italian: Monna Lisa [ˈmɔnna ˈliːza] or La Gioconda [la dʒoˈkonda], French: La Joconde [la ʒɔkɔ̃d]) is a half-length portrait painting by the Italian Renaissance artist Leonardo da Vinci that has been described as "the best known, the most visited, the most written about, the most sung about, the most parodied work of art in the world".The Mona Lisa is also one of the most valuable paintings in the world. It holds the Guinness World Record for the highest known insurance valuation in history at $100 million in 1962,which is worth nearly $800 million in 2017. 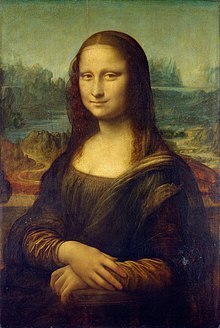 The painting is thought to be a portrait of Lisa Gherardini, the wife of Francesco del Giocondo, and is in oil on a white Lombardy poplar panel. It had been believed to have been painted between 1503 and 1506; however, Leonardo may have continued working on it as late as 1517. Recent academic work suggests that it would not have been started before 1513.It was acquired by King Francis I of France and is now the property of the French Republic, on permanent display at the Louvre Museum in Paris since 1797. Painter: Leonardo da Vinci. Leonardo di ser Piero da Vinci (Italian: [leoˈnardo di ˌsɛr ˈpjɛːro da (v)ˈvintʃi] (About this sound listen); 15 April 1452 �C 2 May 1519), more commonly Leonardo da Vinci or simply Leonardo, was an Italian Renaissance polymath whose areas of interest included invention, painting, sculpting, architecture, science, music, mathematics, engineering, literature, anatomy, geology, astronomy, botany, writing, history, and cartography. He has been variously called the father of palaeontology, ichnology, and architecture, and is widely considered one of the greatest painters of all time. Sometimes credited with the inventions of the parachute, helicopter and tank,he epitomised the Renaissance humanist ideal. Many historians and scholars regard Leonardo as the prime exemplar of the "Universal Genius" or "Renaissance Man", an individual of "unquenchable curiosity" and "feverishly inventive imagination",and he is widely considered one of the most diversely talented individuals ever to have lived.According to art historian Helen Gardner, the scope and depth of his interests were without precedent in recorded history, and "his mind and personality seem to us superhuman, while the man himself mysterious and remote".Marco Rosci notes that while there is much speculation regarding his life and personality, his view of the world was logical rather than mysterious, and that the empirical methods he employed were unorthodox for his time. Leonardo was, and is, renowned primarily as a painter. Among his works, the Mona Lisa is the most famous and most parodied portrait and The Last Supper the most reproduced religious painting of all time. Leonardo's drawing of the Vitruvian Man is also regarded as a cultural icon,being reproduced on items as varied as the euro coin, textbooks, and T-shirts. A painting by Leonardo, Salvator Mundi, sold for a world record $450.3 million at a Christie's auction in New York, 15 November 2017, the highest price ever paid for a work of art. Perhaps fifteen of his paintings have survived. [nb 1] Nevertheless, these few works, together with his notebooks, which contain drawings, scientific diagrams, and his thoughts on the nature of painting, compose a contribution to later generations of artists rivalled only by that of his contemporary, Michelangelo. Leonardo is revered for his technological ingenuity. He conceptualised flying machines, a type of armoured fighting vehicle, concentrated solar power, an adding machine,and the double hull. Relatively few of his designs were constructed or even feasible during his lifetime, as the modern scientific approaches to metallurgy and engineering were only in their infancy during the Renaissance. Some of his smaller inventions, however, such as an automated bobbin winder and a machine for testing the tensile strength of wire, entered the world of manufacturing unheralded. A number of Leonardo's most practical inventions are nowadays displayed as working models at the Museum of Vinci. He made substantial discoveries in anatomy, civil engineering, geology, optics, and hydrodynamics, but he did not publish his findings and they had no direct influence on later science. Buy Mona Lisa, please click here.